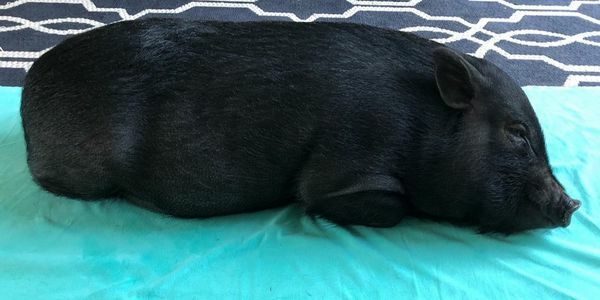 Our city of Sylvania Township, Ohio which I have resided in for over 51 years and respect greatly, has issued a court order against us to remove our family member Milo (pig), who is not only a living domesticated soul but a true enlightenment to us, within 30 days due to a neighbor complaint. Words can't describe how he has enhanced our compassion, love and empathy not only for him but for mankind. He has brought pure joy to us and deserves to live in harmony as he currently does. We have hired an attorney and are going to fight this with all we have so he can remain with the only family and environment he has ever known. I can't get into our legal strategy at this point. We also have television and additional media coverage set to share Milo's story. Please share this information with the #freemilo as you are not only doing a service to him and the Crandell family but to others who benefit from him as well. As I type this I have tears in my eyes trying to understand why someone would want to take him away from us and not simply let him live in harmony and peace. WE ARE NOT ASKING FOR MONEY but rather support, compassion and undserstanding. Also this has nothing to do with the non profit Racing for Recovery that I started in 2001. This is peronal not professional.